We've been to Yosemite many times. First time we went there for the Memorial Day weekend and it was horribly crowded. I could say that we almost had to wait in line to hike. Still, the waterfalls were at their peak and I enjoyed it and wished to come back at a better time. Second time we went at the beginning of April. This time it was entirely different, few people were visiting and at times we had the nature all to ourselves. The view from Yosemite valley takes your breath away. You get struck by the magnificent and diverse landscape of this park. The best known features of Yosemite are the waterfalls, El Capitan (largest and tallest exposed granite cliff), the unusual rock formation of Half Dome, and several groves of magnificent Giant Sequoia trees. The perfect season for seeing the waterfalls is spring. 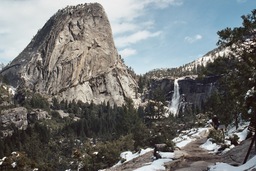 The reason is that the warmer weather begins to melt the snow, and the flow of waterfalls increases. You will also see many small, unnamed waterfalls and cascades all along the Valley rim. Most of them diminish and even dissapear in the summer. There are a dozen of places to climb and hike and so many photo opportunities. The park is 4.5 hours drive from San Francisco and a 6 hour drive from Los Angeles.